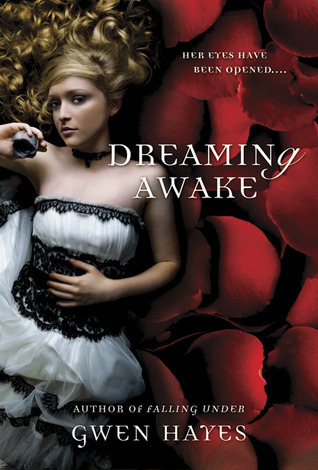 Dreaming Awake is the sequel to Falling Under. We are left off at the end of Falling Under where Theia has taken Haden's place in Under. Mara has cursed Theia with demon blood- and this seems to have negative repercussions. As Theia is summoned back to Serendipity Falls by her friends (through a demon summoning), things are not as she left them. I am still not completely sure how I feel about this book. On one hand, it is an incredibly well written book- I really couldn't put it down. On the other hand, this book was depressing! It seemed like the characters never got a break- they truly were in a living nightmare! There was not a great deal of romance in this book; it was much more of an action book than paranormal romance. This book really focused more on Theia than Theia's relationship with Haden. I will give one warning about this book- it had many more horror elements than I anticipated. I am admittedly a bit of a pansy when it comes to books (over active imagination), but this book (especially the second half) read more like a gothic horror book than paranormal romance. I enjoyed this book, but I am not sure if I will continue with the series for that reason. I am positive there will be a third book- there are many unanswered questions and the book stops mid-scene. Oh, I didn't know this was a sequel. It's weird I see it everywhere and had no idea. I have to check the first one out ! The first cover is very similar. I loved Falling Under, and I am very anxious for this one. I didn't really like falling under so I am not sure if I should read this one.